This month, healthier skin is equal to a healthier world! Philanthropy has always been part of the DNA at Kiehl’s Since 1851. The Mission of Kiehl’s states that Kiehl’s must “improve in some way the quality of the community to which it is committed… making for better citizens, better firms, and better communities.” To that end, Kiehl’s focuses its efforts first and foremost on the betterment of its local communities. Inspired by Kiehl’s pharmaceutical and scientific heritage, the Kiehl’s Limited Edition project in India reinforces their long-standing commitment to philanthropy, science and education.To commemorate its 5th Anniversary in India, Kiehl’s has partnered with actress Neha Dhupia and Teach For India to establish ‘Kiehl’s Gives’ – an ongoing global initiative to promote philanthropy. For the first time in India, the brand will retail a special edition of their Ultra Facial Cream – the world’s favourite moisturizer –100% net proceeds from which (up to INR 7,00,000), will go straight to Teach For India in February 2016 to educate underprivileged children across the country. Kiehl’s, along with Teach For India and Neha Dhupia wants to bring an end to India’s educational crisis. In India, according to Teach For India, 90% children start school, 58% drop out of primary school and only 10% finish high school and go on to study in colleges across India. “Teach for India tirelessly works towards bridging the gaps and challenges that underprivileged children face in education. Supportive partners like Kiehl’s share our passion for improving the lives of these kids, and fostering optimism and making education a human right,” says Neha Dhupia. The special edition designed bottle echoes with Neha Dhupia’s sentiment to“give where you live” to eliminate educational inequality in India. Purchasing 10 jars of Kiehl's Ultra Facial Cream will help bring excellent education to 1 child in a Teach For India classroom for 1 year. The vision for this vibrant bottle label has been a collaborative effort between Neha Dhupia and the children from Teach for India. Colourful butterflies take to the skies in the same manner as children live up to their full potential – charting their distinctive journeys to success and happiness. With Friend of Kiehl’s and celebrated model, Surelee Joseph, Kiehl’s celebrated this collaboration with a fun afternoon at the store at Palladium, Mumbai with the Fellows and children from Teach For India. The launch saw a smattering of Mumbai’s glitterati & cognoscenti who were seen enjoying the Kiehl’s experience – the store, the skincare consultations, the food & drinks, live music and, of course, Kiehl’s products. “Kiehl’s has a long-standing heritage of working to further the cause of children. In our completion of 5 years in India, We are proud to continue this important philanthropic work with Teach For India, an effective, on-the-ground, organization built on the foundation that every child has the right to get an education and that all children deserve a future. 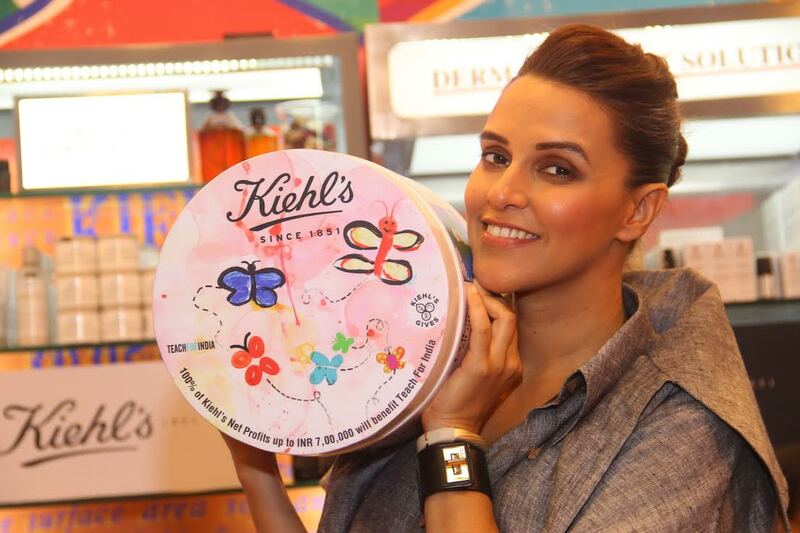 Thank you Neha Dhupia and our Customers for helping support this wonderful cause” says Kiehl’s India General Manager Smira Bakshi." The Ultra Facial Cream is an iconic Kiehl’s formulation loved by customers around the world. Globally, Kiehl’s sells 7 Ultra Facial Creams per minute. In India, 10 Ultra Facial Creams are sold per day. With continuous moisture replenishment throughout the day, this global customer-favourite leaves skin more hydrated, healthier, softer and smoother. The key ingredients include Antarcticine (Glacial Glycoprotein Extract), Imperata Cylindrica (Desert Plant Extract) and Squalane – Kiehl’s signature ingredient – a highly-refined moisturizing oil derived from olives. It has been found to be extremely compatible with the natural oils of the skin. Kiehl’s Since 1851, the venerable New York-based purveyor of fine quality skin and hair care was founded as a classic European-style pharmacy. Kiehl’s founding family established their neighborhood apothecary to fulfill the individual needs of every customer who came through its doors. Assuming the establishment from Mr. John Kiehl, the Morse family nurtured their East Village community, cared for their customers as neighbors, and welcomed every visitor to Kiehl’s as if it were home. In doing so, Kiehl’s founding pharmacists and chemists launched a tradition of personalized service that’s become legendary. Nearly 160 years later, the magic that is ― “The Kiehl’s Experience” extends around the world as the company continues to delight patrons with its high quality products that assure the health of their skin and hair. Today, the family’s message endures ― “We are delighted to serve you”. Kiehl’s skincare and hair-care formulas are known the world over for being highly efficacious as they are formulated using high concentrations of rare & rich natural ingredients. Kiehl’s values of simple & educational packaging, high quality formulas, personalized customer service, generosity in giving complimentary product samples to “try before you buy”, no advertising (Kiehl’s has never advertised over the last 163 years and was built on word-of-mouth) has made it into a beloved skincare company of patrons from around the world. Enjoying a cult iconic status as a serious skincare company from New York, the world over, Kiehl’s came to India in November 2010 with one store in the capital, New Delhi. Receiving an overwhelming reception from customers in India, Kiehl’s decided to rapidly increase its retail footprint by opening more stores in more cities. Today, after just 5 years in India, Kiehl’s is present in 6 cities across the country (Delhi, Chandigarh, Mumbai, Bangalore, Kolkata and Pune) with 9 free-standing stores. Teach For India is a nationwide movement of outstanding college graduates and young professionals who commit 2 years of their lives to teach full-time in under-resourced schools and who become lifelong leaders working from within various sectors towards the pursuit of equity in education. In June 2009, Teach For India placed their first cohort of Fellows in low-income municipal and private schools in Pune and Mumbai. Today, Teach For India is in 7 cities - Mumbai, Pune, Delhi, Hyderabad, Chennai, Ahmedabad and Bengaluru. They have a total of approximately 1,200 Fellows and 1,100 Alumni working towards eliminating educational inequity. Neha Dhupia is an Indian actress and beauty queen (winner of Femina Miss India title) who has worked in several Bollywood movies. She has actively been involved with charitable causes. Neha ran the Mumbai Marathon to support the Concern for India Foundation and has also helped raised funds for the victims of the Sikkim earthquake.